As is true with Vegas, so too Super Bowl Advertising. The odds favor the house, especially when ego is in play, and when people at the the table for the first time. Last night Nationwide Insurance lost badly the the house. The Bowl ad focused on a sweet child recounting the many things he won’t do, because he died in an accident. Nationwide’s insurance really doesn’t address this – so they surfaced a need in a pretty manipulative way, and then couldn’t connect it to their value offer. Were I a parent of a child who died in an accident, I could imagine a mix of feelings. But the long form version of the ad tells what children want to do, and its explains Nationwide’s commitment, even showing humility. The short ad on the Super Bowl didn’t benefit from this. I wish they had. Nationwide blew fitting a good concept in to a short time slot, with deleterious results. I stand with @Nationwide. You people live in a fantasy. Your children could die. When they do, their blood will be on your ignorant hands. So let’s look at the tremendously likable ad Nationwide ran earlier in the evening, Invisible – with Mindy Kaling. New Rule: if the pre-roll ad that YouTube inserts before a Super Bowl leaves a stronger brand impression and sells better, then the Super Bowl Ad has likely missed its mark. I loved Nationwide’s ad premise – but think the message that Nationwide embraces minority markets is about a decade and a half late in the insurance industry. What about Flo at Progressive, is she really not solicitous of diverse markets? If outreach is important, I think of New York Life which has has hired for cultural diversity. While I’m sure Nationwide’s commitment to outreach is earnest, the ad didn’t show that. Viewers can’t tell if that value extend beyond hiring Mindy Kaling for an ad. 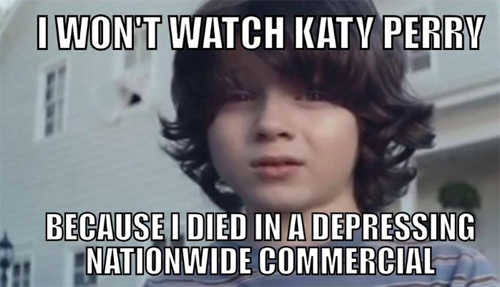 Five seconds of voice over explaining Nationwide’s deep commitment would have helped a lot. Both ads failed to make Nationwide noteworthy beyond its marketing department. They didn’t drive an appreciation for the opportunity to do business with them. Both ads were a bit preachy, raising child safety and ethnic diversity, but without positioning them as a credible next step in progress. Yes, seriously. The Clydesdales and the Lost Dog got 14 million YouTube views. It was a great production and their morning Bud’s marketers feel great. They can be proud of their work, like an architect whose masterpiece outlives the client it bankrupts. Among among drinkers 21-27 Bud has a try rate reportedly under 5%, its overall sales are off hard. Running ads for values feels like a safe, smart bet for an ad agency. But their brand burnishing was so detached from beer that they could as well have been a shoe company. (I elaborate on this, and how Bud’s sponsored bordello is a great example of this storied brand being caught in the scale of its own marketing.) Later in the game Bud ran an ad about beer appealing to hipsters, which was predictable but more on target. Who won the Super Bowl ad contest? Always: #LikeAGirl recognized the significant audience of women, and intersected still lingering concerns about the NFL’s problems addressing violence toward women. Their brand is surging. Newcastle: for mocking the spectacle of interruption based advertising and brand placement…and likely reminding people that whatever ever beer was in their hand, could have been a Newcastle. The biggest collision of brands since Logorama. Like in Vegas, there are winners and loosers. On net, I suspect that smart people who find another way to put their budgets in play will usually do better.